When Terry Lickona came out to announce Nick Cave and the Bad Seeds, he noted that Nick Cave has been around 30 years and that Austin City Limits has been around for 40 years, but this was the first appearance on the show. I’ve been to quite a few ACL performances over the years and the first thing I noticed last night was that the floor configuration for the taping was different than any other that I’ve attended. They gave Nick Cave two walkways out into the crowd and did away with the traditional space between the audience and the stage along with the two floor cameras that are usually right in front. I heard that based on the previous night’s performance to a sold out crowd, they decided that they wanted more audience interaction to make for a better taping. This was my first time seeing Nick Cave live. I’d been exposed to him through Henry Rollins who’s a big fan. I’m also pretty familiar with Cave’s 1992 album, Henry’s Dream, which was an employee favorite at the Sound Warehouse at 49th and Burnet Road where I worked when it was released. His Grinderman side project has been a favorite over the past few years. He’s got quite a stage presence. He reminds me of a goth Elvis with a more overt sexuality, even raunchiness. I don’t know that I would’ve wanted to be in the front on the floor the way he was shoving his crotch at the audience members. You can see the set list below, but the performance included five tracks from 2013’s Push The Sky Away and a sampling of what could be considered his greatest hits from earlier records. As many of those in attendance noted on Twitter, it’s not likely that they’ll air “Stagger Lee” from Murder Ballads without having to censor a good portion of the song. Cave himself mentioned that they wouldn’t air “Mermaids” because of one of the lyrics. I attended with a friend who had never been to a taping before. He noted the lack of cell phones during the performance as a welcome sight. Austin City Limits and Alamo Drafthouse… trying to restore civility to attending movies and concerts. Coincidentally, a Nick Cave documentary, 20,000 Days on Earth, plays tonight at 10pm at Alamo Drafthouse – Ritz. 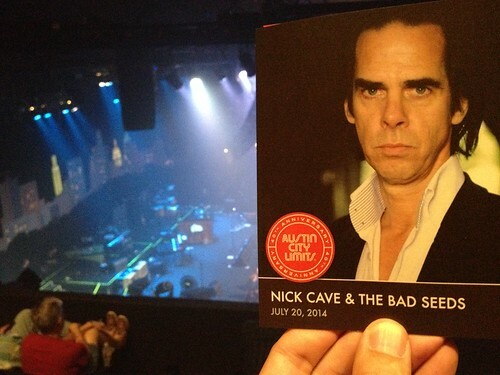 The Nick Cave episode will air in the Fall. Saturday’s parade in observance of Emancipation Day brought out the politicians, including Chris Riley, Sheryl Cole, Mike Martinez, Steve Adler, Kirk Watson, and more; Riley cruised by on a bicycle and Martinez walked the route in flip-flops. Police chief Acevedo traveled the route on foot as well. The mood was festive, as always. Apart from the Wells Fargo team of four drawing a stagecoach, horses were few this year. Church groups, City departments, corporate sponsors including H-E-B, and small businesses were there. The most appreciated were the providers of music, including Spirit of the Drum, the Austin All Star Band, WAMM, and bands all the way from Hearne and Houston. We usually watch from a spot across the street from the Fresh Up Club. This year we returned to the Gonzalo Garza Independence School, where we admired the butterfly garden. There’s no way to capture the spirit, really, but these unedited videos and pix made the attempt. Tweedy is in town tonight for a show at the Texas Union Ballroom. It’s Tweedy the solo project that includes Jeff Tweedy and his son, Spencer, on drums, not just Jeff. They’re backed by guitarist Jim Elkington, multi-instrumentalist Liam Cunningham, bassist Darin Gray and last night were joined by vocalists Holly Laessig and Jess Wolfe from the Brooklyn band, Lucius. The ACL program pointed out that Lucius played the Bloody Mary Morning Party during SXSW 2013. Tweedy is releasing a new album, Sukierae (sue-key-ray), on September 16th. This is his first solo album featuring 20 new songs. He joked that he had to wait 18 years to grow a drummer before he could go solo. I had decided to punt on getting tickets for the show because of the outrageous $80 ticket prices, but got to go to the Austin City Limits taping last night. I last saw Jeff Tweedy solo at Hogg Auditorium in January of 2007. It’s one of the best shows that I’ve ever seen. 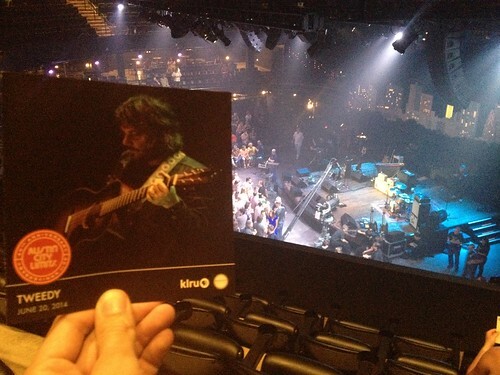 Jeff Tweedy solo shows are typically an intimate affair. It’s just him and his guitar. He even eschewed the microphone for several songs at that show. The intimacy of those solo shows is somewhat lost with the backing band. It was also more difficult to get into the first three quarters of the show because it’s all new material that we’ve never heard. Jeff Tweedy commented on this and thanked the audience for sticking with him. His solo shows are also part stand-up routine with plenty of self-deprecating humor. He managed to squeeze a bit of that into his on stage banter, apologizing to Spencer more than once for possibly embarrassing the 18 year old as he spoke. There weren’t as many sing-a-longs in last night’s show but the crowd was encouraged to join in on “Slow Love”, one of the new songs from the forthcoming album. This is the 40th season of Austin City Limits. Tonight’s show is an encore performance of Raphael Saadiq and Black Joe Lewis & The Honeybears. The Tweedy show at Texas Union Ballroom is sold out. They play Dallas’s Majestic Theater tomorrow night. Austin360 also has a review of last night’s taping. This production of H.M.S. Pinafore captivates. The orchestra’s bigger and brighter than ever (19 members counted), and so’s the chorus (28 members counted). Both the men and the women of the chorus excel, and for once the men get to dance more than the women. The orchestra is bold and bright, a true pleasure to hear. Austin favorites Holton Johnson, Russell Gregory, Janette Jones, and David Fontenot reprised starring roles to great applause; Gil Zilkha as the captain and Carol Brown as Josephine, his daughter, shone. We attended the Sunday matinee that was preceded by a one-hour program for young people. H.M.S. Pinafore held the attention of children for the entire performance. There was no difficulty at all in understanding the snappy lyrics, so clearly sung, but there are supertitles above the stage for anyone who may find them to be a helpful supplement to the performance. This show is crammed with songs that are not to be forgotten. Most are jaunty and funny; some are a bit more serious and are treated so (for example, “Refrain, audacious tar”). Pinafore will make happy people happier and will brighten the darkest day. Remaining performances are: Thursday, June 19, 7:30 pm; Friday, June 20, 7:30 pm; Saturday, June 21, 2 pm and 7:30 pm; and Sunday, June 22, 2 pm. All seats are reserved; tickets may be purchased on line for pick-up at the theater (Brentwood Chistian School, 11908 North Lamar). Thank you, Gilbert & Sullivan Society of Austin! 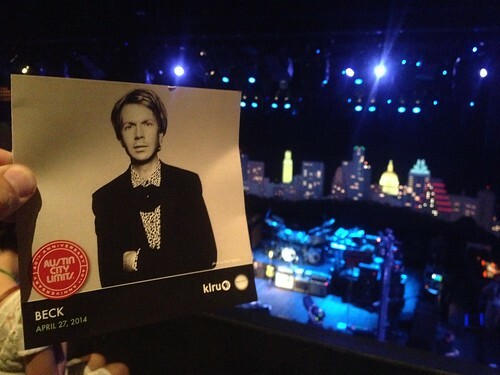 Beck taped a broadcast for Austin City Limits on this past Sunday night. Terry Lickona’s typical pre-show intro included a reminder that Austin City Limits celebrates its 40th year this year. They’re doing some special shows for the Fall that include past performers. They taped the first performances last week with Willie Nelson (the show’s first performer) and also Double Trouble, Stevie Ray Vaughan’s backing band. It’s been a while since I paid very much attention to Beck. I’m glad he’s still out there cranking out music. He’s certainly proven that he’s got the longevity. I remember really cursing that I had moved to NYC during SXSW in 1994 when he played a well received set. That was also the year that Johnny Cash played Emo’s. I picked up Odelay as I moved back in 1995. Since then, the only other Beck album I’d purchased was Midnite Vultures. That’s the one that I (and I’m sure others) like to refer to as Beck’s “Prince Album”. His latest, Morning Phase, is said to be more similar to 2002’s Sea Change which appears to be pretty well regarded and I completely missed it at the time. Judging from the songs from Morning Phase that he played for the taping, it’s definitely an acoustic 70’s pop radio feel. I loved this show because it reminded me of some great radio hits that I’d forgotten and introduced me to some new songs along with songs that I had missed. “Think I’m In Love” from 2006’s The Information is super catchy. I feel like I must’ve heard it before, but even if I didn’t, the first listen had me hooked. I tend to enjoy his more groove-related stuff, but I did find “Blackbird Change” from Morning Phase sticking with me after the taping. The band included guitar, bass, two keyboard/multi-instrumentalists and a drummer, Joey Waronker, with a kit to rival Neal Peart. The drum sound was amazing, particularly the tom toms. During their set (list included below courtesy of Leslie from ACL’s twitter feed), Beck called an audible and decided to do all of the acoustic numbers in the middle. This required a bit of a shuffle for the ACL crew. They also ended up re-doing three of the acoustic songs at the end. Their first stage exit after “E-Pro” was amusing. They all fell down to the ground with their instruments feeding back and then eventually crawled their way, snake-like offstage. I’m hoping they include that in the broadcast. It was likely more amusing for those of us watching from the balcony since we could see what they were up to. To the people on the floor, it probably looked like they had disappeared. I missed “New Pollution” and really could’ve done without “Loser”. It’s one of those songs that’s so overplayed, I probably would’nt mind if I never heard it again. I think it was the most lackluster performance of the entire set. I mentioned in my review of the Fun. taping that the ACL staff has become much more militant about cell phones during the taping. This is understandable, but they must really have had problems over the past year. I typically use my phone to take a few notes for my reviews. I turn the brightness down to the lowest setting and hold the phone down between my knees to minimize distraction. It’s never been a problem, but this time, an usher tapped me on the shoulder and gestured that he was going to throw me out if I didn’t put the phone away. It seems a little overly militant to me though. I guess I’ll be bringing a notepad and pen from now on and kick it old school reporter-like. Beck plays the Austin City Limits Festival this year and the episode that was taped this past week will air in October. The circus: mejor que nunca! Circo Hermanos Vazquez is back in town, set up in the Highland Mall parking lot, and it truly is “better than ever,” which is saying something! The seats in the capacious and sturdy big top are more comfortable than ever. No bad seats are to be found. There’s an eight-person live band again this year to accompany the acts, and the volume is not too loud for anyone, including all the infants, toddlers, and older children at the show attended. There are porta-privies available as there are at most events in Austin, and there are also sinks with soap for hand-washing inside the tent near the food-service area. The lighting seems to be entirely LED and provides excellent illumination. The audience is allowed to take still pictures and videos, so long as no flash is used. There’s a fifteen-minute intermission, during which attendees may have their pictures taken with the beautiful dog-act lady and some of the featured canines, with the result printed on the spot. Following the circus, there were two other photo opportunities, with the clowns and with the beautiful dancing girls. Remaining shows are tonight (Wednesday) and tomorrow (Thursday) at 7:30 pm, plus Friday and Saturday at 6 pm and 9 pm, with the last performances on Sunday, April 13, at 2 pm, 5 pm, and 8 pm. Prices are: adult general admission, $40.00; adult senior general admission, $35.00; children’s admission, $15; so-called “better seats” for adults, $50.00, and for senior adults, $45.00; with “VIP” adult seats going for $60.00. Radio 107.7-fm is stationed at Highland to give away free promotional items. There’s no need at all to know any Spanish to enjoy this Circo Hermanos Vazquez. Safety announcements are made in English for those who need it; after that, words are completely unnecessary. See a few pix and unedited videos; go to the circus! The box office is open every day from 10 am to 9 pm; tickets are also sold at Fiesta Mart. This is just some of the signage at this wonderful BBQ place on Pedernales Street. 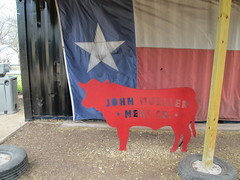 John Mueller Meat Co. was selling out of everything quite early in the afternoon yesterday. We caught some brisket just in time. There were walk-up neighbors dining under the canopy, along by SXSWers. Everyone was happy, and rightly so. It was foggy and damp for today’s parade, but there was music for everyone: the Eastside Memorial band, the LBJ High School band, and a contingent from the 36th Infantry Division band of the Army National Guard complete with banjo and instrumentalists who sang. The Air Force J.R.O.T.C. from Del Valle was there; so were Shriners and a group of Vietnam veterans. There were no political candidates. The day was damp and overcast; spirits were bright. Search this site for recollections of other Texas Independence Day parades. See photographs and unedited videos and look for people you know. 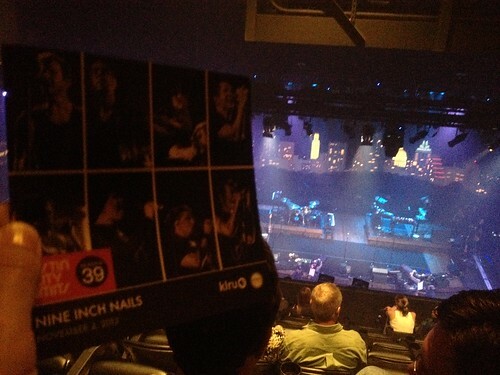 Nine Inch Nails had their Austin City Limits debut on Monday, November 5th at the Moody Theater. The band currently features a bass player, four multi-instrumentalists, two back up singers and Trent Reznor. We all know that Trent Reznor *is* NIN and that’s evident during their live set. He’s definitely the band leader and his control of the set from center stage is evident. His band is a mix of old and new members. One of the back up singers in particular was impressive. This was one of the most uncomfortable tapings that I’ve ever attended. Apparently, the air conditioning was turned off and then later restarted at the band’s request. It was way too hot. I guessing the band regretted that decision pretty quickly. They played ten songs from the latest release, Hesitation Marks. “Sanctified” was the only track from Pretty Hate Machine. “In This Twilight” and “Survivalism” came from Year Zero. My personal favorite album is The Fragile and they played “The Frail” immediately followed by “The Wretched” and later, “The Big Come Down” and “Even Deeper”. They closed with “Hurt” from The Downward Spiral. The episode will air sometime after January 2014. Check the schedule page for air dates. Those who missed Chuy’s parade on Saturday deprived themselves of the sights and sounds of a happy occasion, complete with temperate weather, giant balloons, live music, good cheer, dancing and prancing, and the opportunity to donate toys to Blue Santa. Among the delights were two pipe and drum groups, the Hill Country Plungettes, children on unicycles, the Austin Girls’ Choir, the airport float (a personalized plane with a face) decked out with wreaths and a Santa Claus hat, the Travis High School band and Rebelettes, the Veritas Academy drumline, Los Texas Wranglers, Miranda Gil, the Biscuit Brothers, Ruby Jane, the Hill Country Plungettes, the Summitt Lion & Dragon dance team, a contingent from the wonderful 36th Infantry Division marching band from Camp Mabry, and much, much more. It’s not too late to donate toys or offer other assistance to Blue Santa; there are drop-off locations all over town. See some videos and still images from the parade, and remind yourself not to miss that lovely informal fresh-air event next year. Here for our enjoyment is a lush sonic treat in every respect, and a visual feast as well, with a fine orchestra, a lively chorus, and a uniformly excellent cast of singers in the leading roles, plus a production that fills the stage: Austin Lyric Opera has outdone itself with the current production of Verdi’s Don Carlo. Don Carlo was staged as one of the musical events inaugurating the Performing Arts Center on the UT campus, but has not been performed here since. At the Long Center on Friday, the temperature became chillier as the evening went on, so it’s best to dress for all conditions. Another reason to dress for comfort is that the performance lasts for three and one-half hours. Tickets are still available for the two remaining performances (Thursday, November 21, at 7:30 pm; and Sunday, November 24, at 3 pm). Anyone not able to attend in person may hear a live broadcast via KMFA 89.5-fm radio, beginning at 2:50 pm on Sunday, November 24. This ambitious undertaking is also a strongly successful one and should not be missed! Anyone who loves music and theater is in for a great treat. 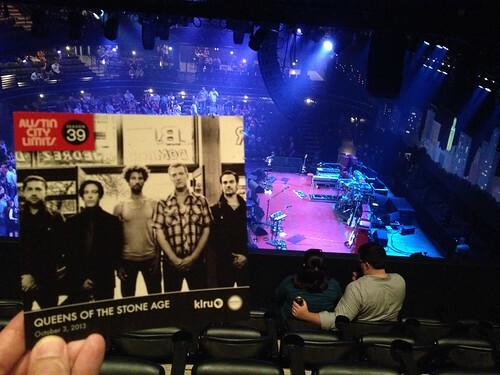 Queens of the Stone Age (QOTSA) had the honor of, as Terry Lickona put it at the start of last night, “kicking off ACL Festival” with their taping at Austin City Limits at the Moody Theater, the show’s home since Season 37. QOTSA have had a rotating line up over the years with Josh Homme being the only consistent member from the days that the band started after the breakup of Kyuss in the mid-90s. That being said, the current line up has been relatively steady of late except for the addition of drummer, Jon Theodore. All of the current members have other side projects or came from success with other bands. Both Josh Homme and Alain Johannes played Austin City Limits before with Them Crooked Vultures in Season 35. They stuck to mostly tracks from their new album …Like Clockwork with eight tracks coming from that album. They played four from 2002’s Songs for the Deaf, which is my favorite of theirs. I tend to associate particular albums with different parts of my life and that one always reminds me of the time right before my daughter was born. I was listening to it in the car at the time and particularly remember it going to and from midwife appointments. “In the Fade” was the only track from Rated R and “Little Sister” was the only track from Lullabies to Paralyze. “Misfit Love” and “Make It Wit Chu” from Era Vulgaris. I understand why they’d focus on the latest, but I would’ve liked to see a few more tracks from both Songs for the Deaf and Lullabies to Paralyze. I agree with some of the reviews that I’ve read that the last two albums tend to be less driving than the two more recent efforts. The episode will air as part of Season 39 on January 4th at 7pm on KLRU locally. The band plays the Austin City Limits Festival tonight at 7:30pm on the Bud Light stage and at the same time and stage next Friday as a part of the second weekend. 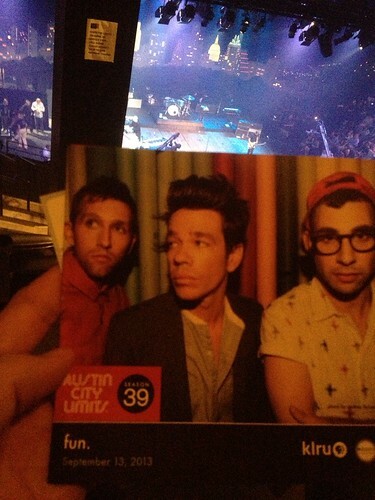 Austin City Limits Taping – Fun. Fun. made their first appearance at the Moody Theater downtown last night. This taping had the most kids in attendance that I think I’ve ever seen at any ACL show. I also noticed for the first time that they made multiple announcements that people need to be in their seats by the 8pm show start time and that they *really* don’t want people to have their cell phones out. This has been the policy all along, but they must be having problems with morons who either can’t pull themselves away from the bar or feel the need to try to take photos or video. Fun. is perfectly suited for live audiences. Every other song is an anthem with plenty of opportunities for audience participation. They remind me a bit of Queen in that respect. Hopefully, the crowd singalongs will come through in the broadcast. Nate Ruess has an impressive voice, another similarity to Queen. Unfortunately, it appears that he’s been having some voice issues and they ended up cancelling the today’s show in Florida with Mumford & Sons. I didn’t notice him struggling during the taping, so I’m glad that he was able to pull off the television show. Jack Antonoff, guitarist for Fun., mentioned his love for Austin and that he’s played at Beerland, the smaller room at Emo’s, the larger room at Emo’s, the small room at Stubb’s and then outside at Stubb’s last year when they had their breakout singles from their second album, Some Nights, which also landed them a couple of Grammys. The band was accompanied by three other musicians for the night’s broadcast. I was only familiar with their singles. They played an even mix of material from both of their albums. My wife and I particularly enjoyed “The Gambler”, a song Nate Ruess apparently wrote for his parents. Fun. will play the Austin City Limits festival on Friday, October 4th at 4pm on the AMD stage and Friday, October 11th at 4pm on the Lady Bird stage. The 39th season of Austin City Limits begins airing locally on KLRU on Saturday, October 5th.